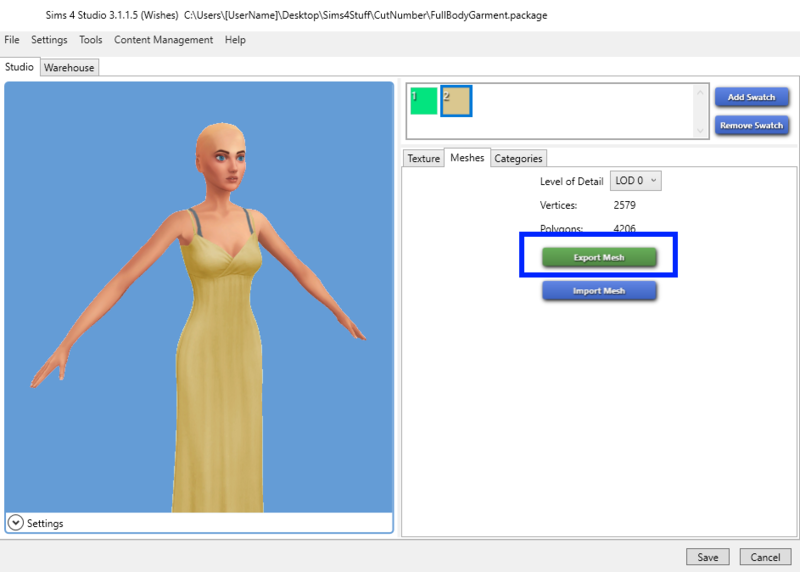 Cut numbers are what Sims 4 Studio uses to determine which mesh group in your .blend will be used to replace an EA mesh group in the original LOD. If the EA item you cloned has multiple mesh groups, you need to have a corresponding mesh group for each and your mesh group must have the cut number of the EA mesh group you want it to replace. 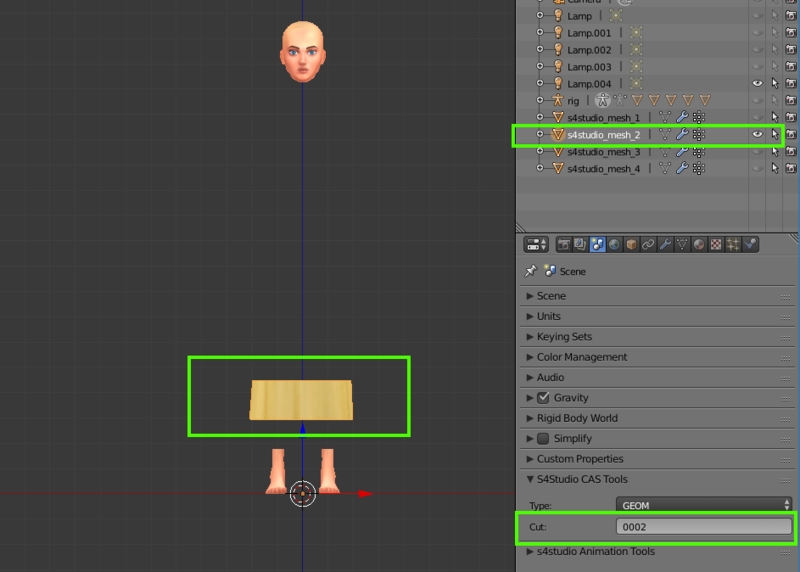 If you are missing a cut number, Studio will not replace the EA mesh group that has that cut number, and it will stay in the package, show in the Studio model viewer, and be visible in the game. This tutorial explains this a bit more and shows how to change the cut numbers of your mesh groups to match those of the original EA item. There are a few troubleshooting tips at the end, also. This tutorial assumes you know how to clone an item and make your mesh. It will not show you how to do those steps. Open the resulting .blend in Blender. You will find a list of all mesh groups in the original EA item on the right side. 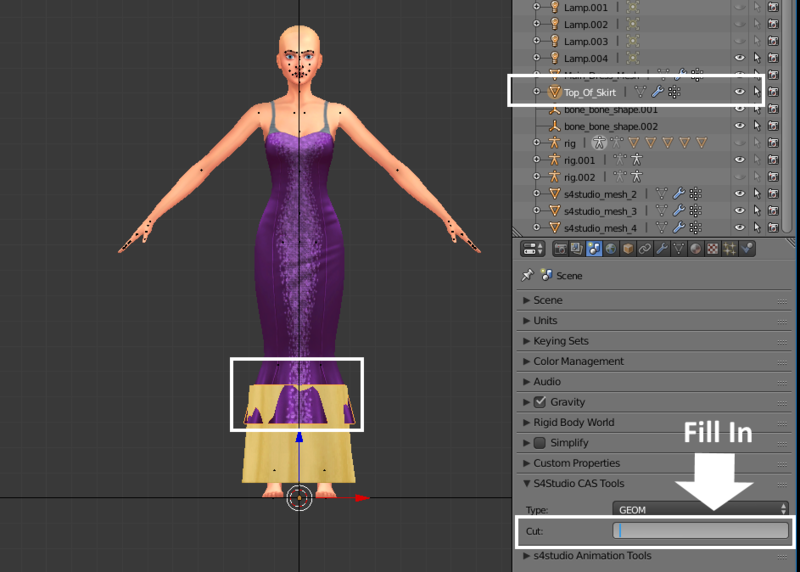 The dress I cloned has four mesh groups. Click on one of the mesh groups to select it. This will cause the cut number of that mesh group to show in the Cut field below. In the picture below, all the mesh groups are enclosed in the white box. The green arrows are pointing at the selected mesh group (s4studio_mesh_1) and its cut number (0003). Please note, these numbers exist in the original item and they were selected by EA. For whatever reason, the cut numbers are not consistently assigned to the mesh groups. What this means is, in some items mesh group one may have a cut number of 0003 as in this case, but in others, mesh group one may have a different cut number. The only way to know the cut number for sure is to check. Also of importance, different LODs in the same item can have different numbers of mesh groups, and the cut numbers of those mesh groups may vary. You need to export each LOD and examine it to know how many mesh groups it has and the cut numbers of its mesh groups. Now that you have determined the cut number for mesh group one, you need to find out what part of the item mesh group one is. Selecting it by clicking on its name will highlight the mesh group in orange in the 3D view (Blender's model viewer). If that is not clear enough, you can also hide all the other mesh groups by clicking the little eye to the right of the mesh group name leaving only mesh group one showing. In the picture below, the white box encloses all the little eyes that have been clicked to hide mesh groups, and the green boxes enclose the only unhidden mesh group and the corresponding mesh in the 3D view. 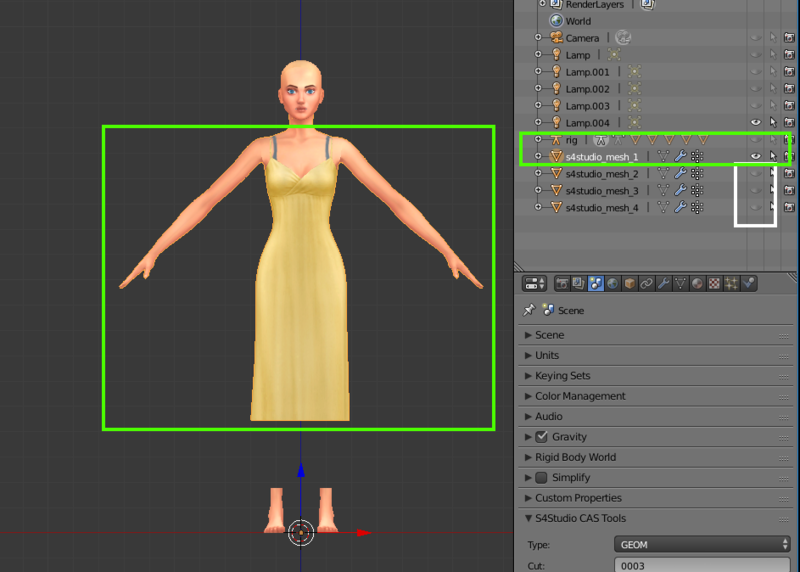 Now it is absolutely clear what part of the dress and Sim body correspond to s4studio_mesh_1. It consists of the torso, arms, waist, hips, thighs, and the uppermost part of the skirt. This step can be repeated for each of the mesh groups in the original item. To un-hide a hidden mesh group, just click on the eye again. The picture below was taken after I hid mesh group one and un-hid mesh group two. This mesh group has a cut number of 0002 and consists of the part of the skirt directly below mesh group one. Once you've gone through the original item and determined the cut number for each mesh group, you're ready to start adding your mesh groups to the .blend and removing the EA mesh groups. In the picture below, I've added a part of my new dress. 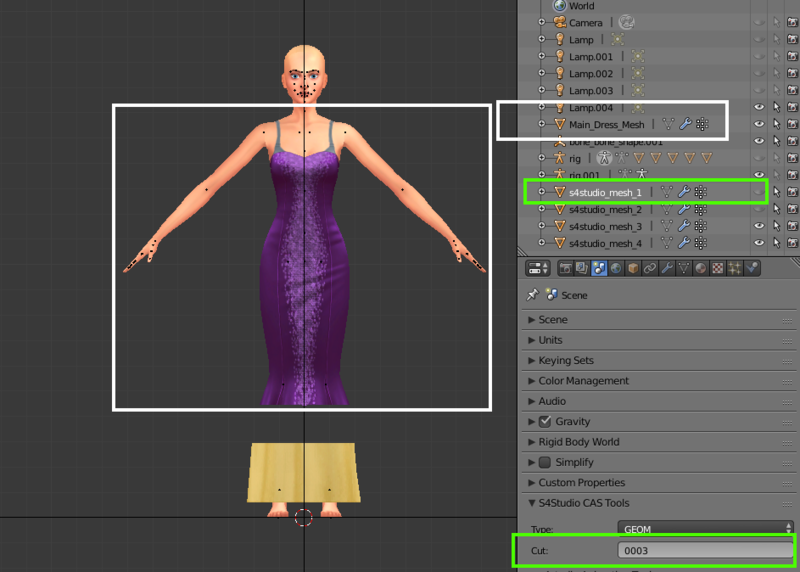 On the right side, you can see the name of my new mesh group (Main_Dress_Mesh) enclosed in a white box. The green boxes enclose the EA mesh group I have selected and its corresponding Cut field. 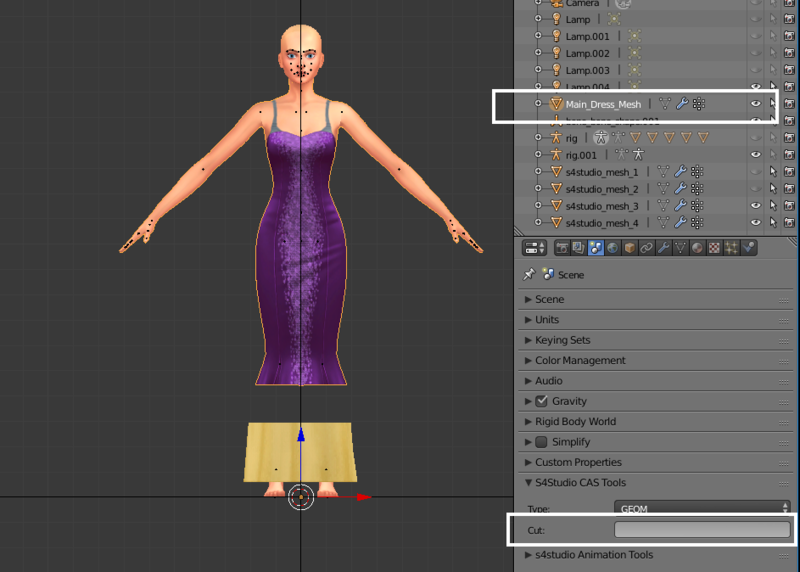 As shown above, this mesh group is the main dress mesh of the EA item (torso, arms, waist, hips, thighs, and uppermost skirt). The mesh I've named "Main_Dress_Mesh" also contains the majority of my new dress and goes from the torso to just below the knees. Since EA mesh group one and this mesh group of my new dress cover similar parts of the Sim, I want to give my new mesh group the cut number that EA's mesh group one has. This is an important point. For more information about why this is important please see THIS DOCUMENTATION. Here, all I will say is, if you do not cut your item into mesh groups that roughly approximate the size and position of the EA mesh groups you are replacing, the Sim that wears your new garment may show odd positions (arms crossed or jammed into the body) in the game. 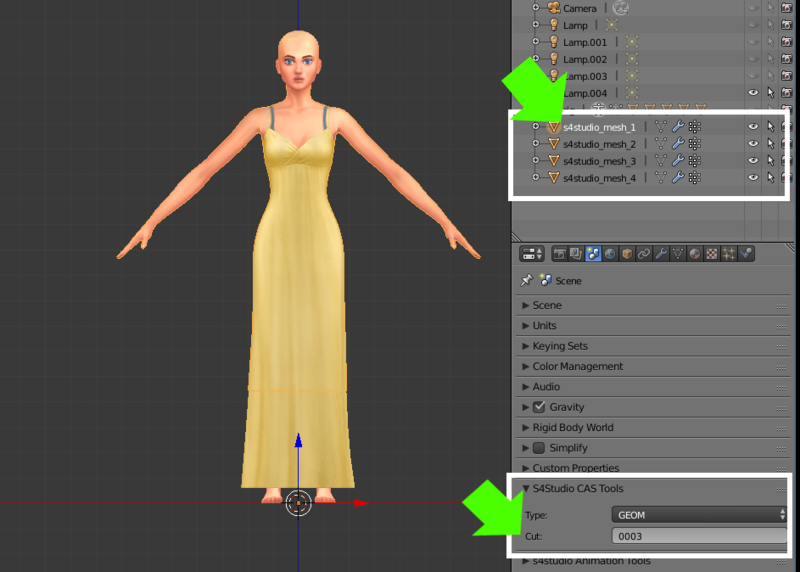 In the picture below, I've clicked on my Main_Dress_Mesh to select it. The cut number field is empty. To add a cut number, just place your cursor in the empty field and type it in using your keyboard. Once you have added the cut number to your mesh group, you can delete the corresponding EA mesh group and move on to your next mesh group. 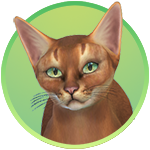 In the picture below, I've removed EA's mesh group one (you can see it is gone from the mesh group list) and added my next mesh group. It's cut number field is empty, so I will need to fill in the next cut number. Remember, if you leave the cut number field emtpy, Studio will not know that this mesh group should replace an EA mesh group. This will cause the EA mesh group to remain in the package (it will still show in Studio's model viewer) and your new mesh group will simply not show up at all. For this reason, it is important to remember to add a cut number to each of your new mesh groups. Once you have added all your new mesh groups and assigned a cut number to them, remove all the EA mesh groups. If you do not, you will have more than one mesh group with the same cut number. If Studio encounters a .blend where two or more mesh groups share a cut number, it will only include one of those mesh groups in the .package (whichever it runs into last). This may or may not be the one you want in the .package. In the picture below, all the EA mesh groups have been removed. All of my new mesh groups have been added. The white arrows indicate the last mesh group I added and its filled-in cut number field. 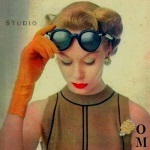 Once you are at this point, click File and Save your .blend. 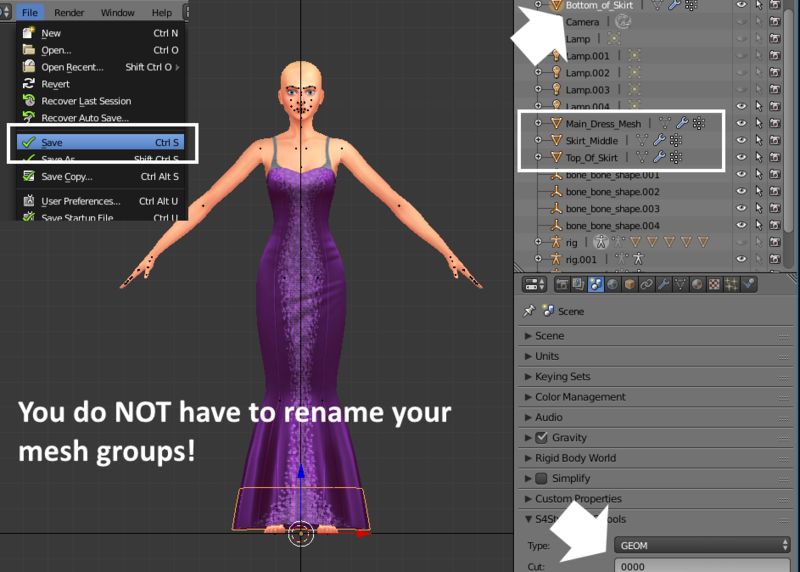 Please note, you do not have to change the names of your mesh groups. You can name your mesh groups anything you want. Studio does not look at the mesh group names at all. It only uses the cut numbers when replacing EA's mesh groups with yours. It is, thus, a complete waste of time to rename your mesh groups if you've already named them something else (so don't bother doing that). Once you've completed LOD 0, you need to repeat the above steps for all LODs in the .package. Please remember, the other LODs may have a different number of mesh groups with different cut numbers. 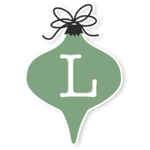 In some cases, you cannot simply use the LOD 0 .blend to replace all the other LODs. Could you explain why some meshes have little squares cut out of them? I've noticed some meshes have 8 cuts, about four or so being little squares from the arms, or chest. linzlu , there is a source in EA's files that is caller RegionMaps. It controls what part of the item will be hidden if another clothing will be on. For example it is used when you put high boots on the sim and bottom part of the pants gets hidden, or when you put a hat. So each piece of geometry has own layer name and number that defines how it will interact with another items on the sim. You can see a discussion in this thread to see how it's used. Hiii! I started doing my cc I have seen many tutorials and this time I followed this tutorial, the problem is that when I pass the mesh to s4s it looks like this [https://drive.google.com/open?id=1y-QPqlgGjXzwZKI7oQpUE_-TVfzimz4b] (with and without the texture) I read what could be the cut numbers but the top that I use from EA indicated GEO 0000 as well as mine, could someone tell me why? Thank you!